The Oriental Cat generally shows in a solid color or tabby-patterned in a wide variety of colors. Approximately 300 various colors and patterns are recognized. This is true for both the shorthair and longhair varieties. 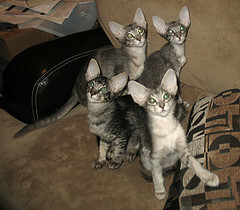 The CFA allows Oriental Longhairs and Oriental Shorthairs to compete as divisions within a single breed. Longhair variety: Recently accepted as a version of the Oriental Shorthair, the Oriental Longhair has a semi-longhair coat, which softens the long lines of the Oriental body. 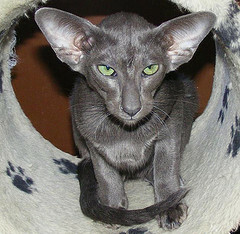 Shorthair Variety: A slick, very smooth coat, similar to the Siamese, characterizes the Oriental Shorthair. Virtually maintenance free, this cat’s coat is best left to the cat for maintenance. Many breeders recommend not bathing show cats. This is definitely one of those who simply do not need for humans to bathe them. That having been said, I will add that many Orientals very much enjoy an occasional brushing with a rubber brush, and of course, lots of petting. A playful, intelligent and loyal companion, these cats are curious and talkative. The Oriental cat will demand, in no uncertain terms, your love and attention. An Oriental Cat in the house means constant supervision. Though not really a lap cat, Orientals do enjoy being cuddled and stroked. These outgoing felines adapt very well to a busy family home. They usually play well with children, though they may need time to adjust to the new situation, if they’ve just come from a relatively quiet household. A good climbing and scratching post will help them to work off energy and the exercise helps them maintain their elegant, lean body. A graceful, slinky looking cat with long graceful lines, the Oriental's body is a very hard, muscular shape, being the same size at the hips and shoulders. Slim legs and tail are long, which helps to balance the body length. The Oriental head, much like the Siamese, is a long wedge with straight lines extending into a beautifully large, flared ear. For show purposes, much emphasis is placed on the absolutely straight profile. This cat comes in more than 300 colors. Eye color should be green except in whites or bi-colors, which also may be blue or odd-eyed. A most vocal and attentive companion, the Oriental Cat is a curious and warm hearted feline. Usually choosing to be nearby, if not right on top of his human family, the Oriental will remain loyal throughout its life, and does not display the aloofness sometimes associated with other cats. This breed will greatly appreciate having a nice tall cat tree or condo available, as they love to climb to a high perch to watch the goings on in the household. They are very energetic cats and will often be seen racing through the house and up their tree in a flash, for no apparent reason other than the sheer fun of it.